"What are your plans for New Year's Eve?" Around the middle of December, that question is only topped by... "What are you wearing for New Year's Eve?" The Top Spot to Celebrate New Year's Eve in Anguilla? 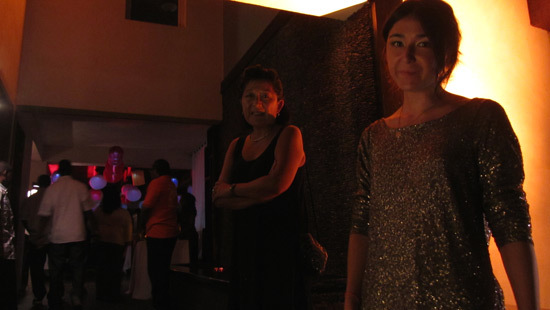 From the New Year's Eve dress to the New Year's Eve party, it is one of the biggest nights of the year. In Anguilla, people ring in the New Year with fervor too! ...Especially since New Year's Eve is one of the hottest times to be in Anguilla, and no, I'm not talking temperature-wise. The Holiday Week, spanning from Christmas-New Years, is Anguilla's busiest time of year. So, Anguilla New Year's Eve parties are not in short supply. 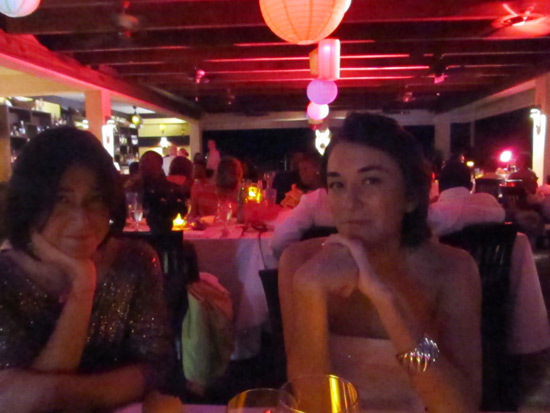 A Little Known Fact... Anguilla New Year's Eve is actually called Old Year's Night. Anguillians celebrate saying good-bye to the old year! Where to Celebrate Anguilla New Year's Eve, or Old Year's Night? 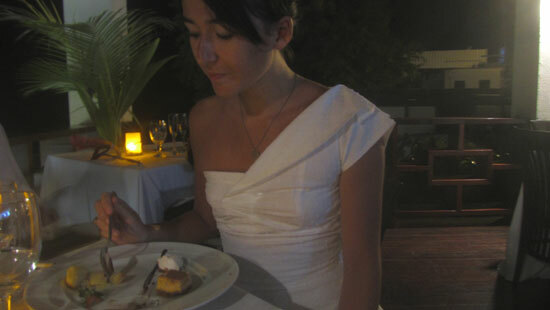 With many parties and Anguilla restaurants to choose from, the selection is vast! Most years, our family doesn't go all out for New Years. We clink glasses at midnight at home, wish each other Happy New Year!, and are usually in bed by 1 AM. Not much of a party, and certainly no fancy dresses. But, this year, we decided to go for it! Once we decided to go all out, the question came up (again)... Where to go? Generally, I'm not one for parties and celebrations. I tend to not get excited about events, big evenings, and so-called ultra-special nights. 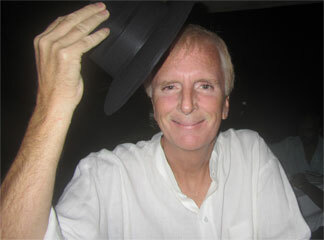 But, the photos I had seen of Anguilla New Year's Eve party at da'Vida compelled me to celebrate! 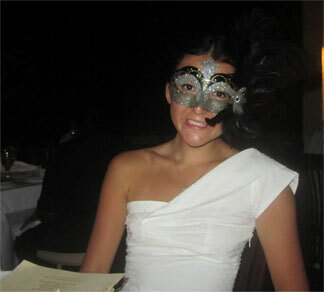 It looked classic, classy, women wearing Venetian masks, men wearing black Bowler-type hats. A true Old Year's party as people would have done years ago. There was no question: da'Vida for Anguilla New Years Eve it was! The photos had not lied. da'Vida's setting is breathtaking any day of the week. That night, it was enchanting. Trees were delicately lit with strings of sparkling, white lights. Exotic balloons imported from Bali hung from the ceiling. Just beyond the restaurant's borders, Crocus's calm waters were illuminated, shining a soft sea-green. da'Vida's dining room glowed a special New Year's Eve glow. Our Old Year's hostess showed us to our table. Confetti, beaded necklaces and colorful "noise makers" adorned the tables. On the plates lay our Venetian masks and my Dad's black hat. Yuki was the first to put on her mask, tied not with an elastic, but with a soft, gentle ribbon. My Dad put on his New Year's hat. Seafood with a "tropical fruit experience"
An exciting meal lay ahead! 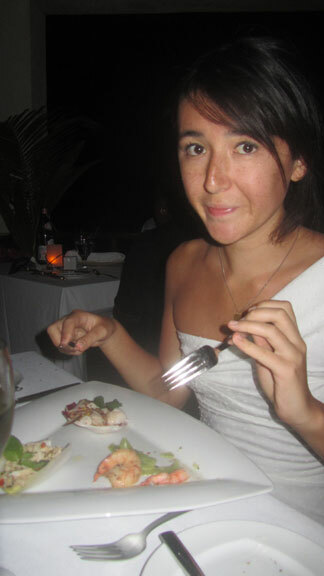 We were afraid she would have to sit the third course out. She has a severe allergy to fish. We warned our waiter of her condition. "The chef can prepare a separate meal, she will certainly have a third course!" da'Vida's five star service at its best. 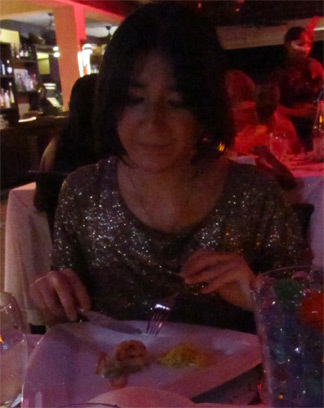 The food was innovative, different, always divine. From their steak to their spicy beef medallion, da'Vida always has the best beef. As we enjoyed our courses, we listened to the jazz band play, watched guests danced. And then, as always, came back to watching the sea, and enjoying our family Anguilla New Year's Eve party, in a setting that was everything we hoped it would be. ... And ready to sleep. Everyone stayed on 'till midnight to enjoy the traditional, age-old midnight cheer. "HAPPY NEW YEAR!" We wanted to continue, but my Dad was falling asleep at the table. He was at home and in bed as quickly as we could say Happy New Year! Dancing and festivities apparently continued into the wee hours at da'Vida. We had arranged to meet friends at Pumphouse and Elvis' in Sandy Ground. The street was jammed and hopping, a real "party" atmosphere. Fireworks, drinks, dancing, cheering, people shoulder to shoulder. Be sure to make Sandy Ground part of your after-dinner party, no matter where you start from. The after-Sandy Ground tradition is to carry on Old Year's Night well past 4 AM and watch the sun rise from Bankie Banx's Dune Preserve. Bankie has an open bar and breakfast of quiches and croissants. It had been a full Old Year's Night, and New Year's Morning. 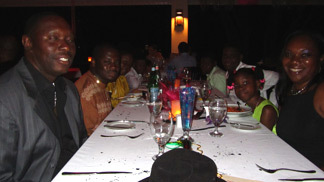 Without a doubt though, da'Vida's Anguilla New Year's Eve party was truly the highlight. 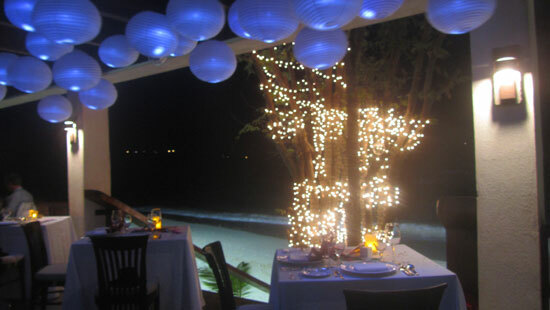 Elegant atmosphere, world-class food, an illuminated sea-side, all to the accompaniment of a live jazz band and dancing. A classy, classic celebration, in the fashion of elegant New Year's Eve parties held years ago, there is no better way to ring in the New Year, and say good-bye to the Old Year, than at da'Vida. 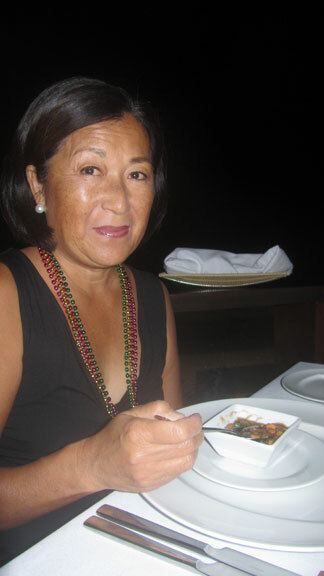 The 2010-2011 NYE party at da'Vida was such a special evening that when we saw "A Night in Japan," da'Vida's 2011-2012 Anguilla New Year's Eve party advertised, we quickly made a reservation! 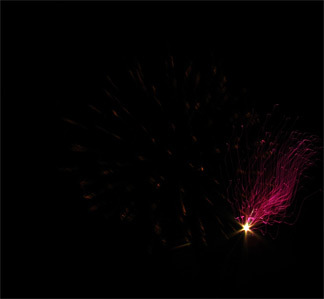 The four-course meal, live entertainment and fireworks (new for the 2011-2012 NYE bash) promised a memorable New Year's Eve. Walking into da'Vida for New Year's Eve is like walking onto a cloud. 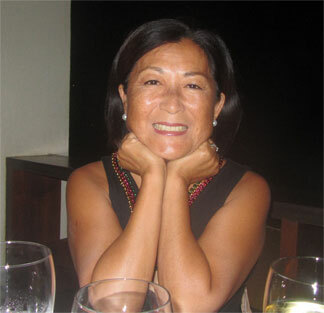 At the restaurant's threshold, a glowing light pink hue came from within. 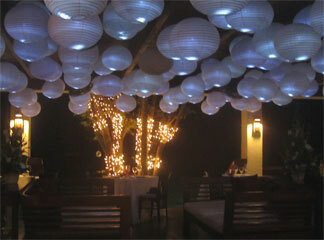 We could spot the delicate hanging paper lanterns (imported from Bali). As we walked in, we spotted Vida and Clyde, who are two of the three da'Vida owners, celebrating the new year with their family. My Dad's eyes lit up, excited to catch up with Clyde over a New Year's Eve cocktail. If you ever have the chance to shake hands with Clyde and Vida, do. They are two of the most fun and kind people we know. The tables were dusted in shimmering confetti, set in a festive manner. There were bowler hats for the gentlemen and Venetian masks for the ladies, a touch we were looking forward to again this year! The restaurant was full, everyone dancing, eating, drinking, and just enjoying da'Vida's ambience. 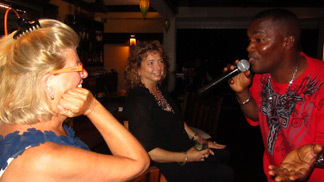 We even saw our favorite Anguilla real estate, Jackie Pascher, who was serenaded by the live entertainment of the evening. The entertainment had started at 8PM and went on past midnight. They played all kinds of hits, even sang happy birthday to one of the guests, and made a very special announcement, a groom asking his best friend to be the best man at his wedding! From the guests, to Clyde and Vida, to the entertainment... Everyone made this a night to remember. My Dad kicked off the evening with his classic rum punch. The rest of us went with sparkling wine. Over a fresh basket of bread and Johnny Cakes, we anxiously awaited the appetizer course. Special Tip: Last year we made our reservations too early at 7PM. The eating (which is half the party as far as I'm concerned ;-) was over well before midnight. Starting dinner later lets you enjoy the atmosphere right up until midnight. We highly recommend making a New Year's Eve reservation for 9PM. Like last year's party, da'Vida promptly replaced Yuki's fish dish with a chicken dish, being extremely conscious of and accommodating to Yuki's fish allergy. Each dish pleased the palate. Like clockwork, as we finished our last bites of dessert, we were handed glasses of champagne. Going straight from chocolate to champagne was a tasty transition. It was time for the count down! The room pulsed as the countdown began. The skies broke immediately, washing away the old year, ready to start a-new. The party continued into the night down at da'Vida's Bayside Grill. More on Anguilla's New Year's Eve.